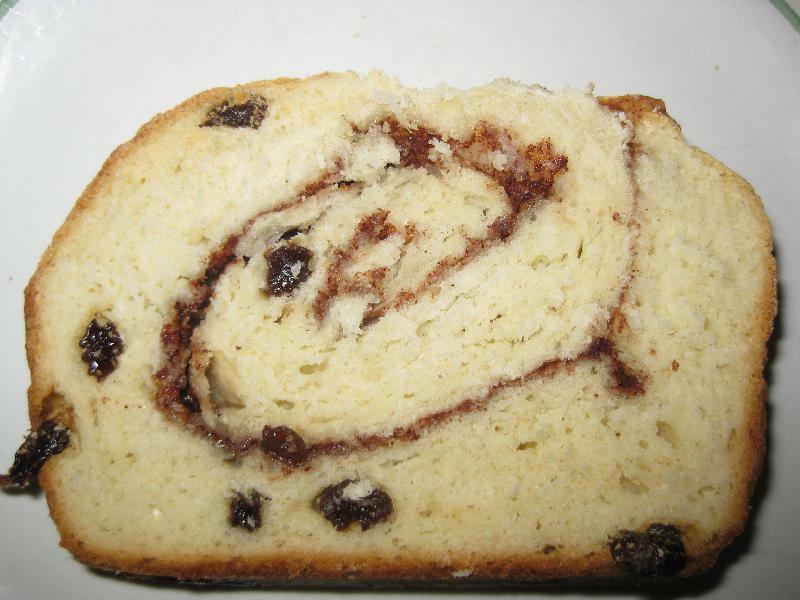 As a child my mom used to always make homemade cinnamon raisin bread. I just asked her for her recipe but she could not find it. So I went in search of one and came across this one and had to try it. It made quite a bit of bread - 3 loaves! It is very yummy. Heat the milk in a small pan until it bubbles. Let it cool to a lukewarm temp. In a large bowl dissolve the yeast in warm water. Set the yeast aside until it is frothy. Mix in the eggs, sugar, butter, salt, and raisins. Next add in the cooled milk. Gradually add in the flour to make a stiff dough. Knead the dough on a lightly floured surface for a few minutes. Put the dough in a large, greased, mixing bowl, and turn to grease the surface of the dough. Cover the bowl with a damp cloth and allow it to rise until doubled. This took about an hour. On a lightly floured surface roll the dough into a large rectangle 1/2 inch thick. Moisten the dough with 2 tablespoons of milk. Mix together the 3/4 cup sugar and 2 tablespoons cinnamon, Sprinkle the mixture on top of the moistened dough. Roll the dough up tightly. The roll should be about 3 inches in diameter. Cut the dough into thirds, and tuck under ends. Preheat the oven to 350 degrees. Bake the bread for 45 minutes or until they loaves are lightly browned. Remove the loaves from the pans. Let the bread cool before slicing. anonymous : I love cinnamon raisin bread. I'm sure I could eat the whole loaf. You did a good job!